Paper: Why We Do It? Five years, two 8-week classes, more than 60 games under my belt, about 500 hits by a baseball and more memories than I can count. Now, in my final year with the organization, I am here to tell the story behind the mask. With this job being too stressful with fans, coaches, even little children, it's a mystery why I decided to join. The answer is actually quite simple. You're not going to find out here, though. To find this out, take a look at the paper I wrote, Why We Do It? My journey through this job has been full of funny moments and serious situations. 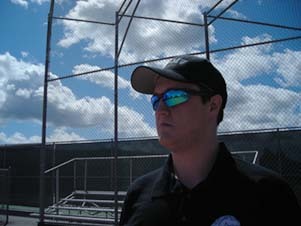 My podcast, The Perspective of an Umpire, shows people what it is like to be out there on the field with kids, coaches and parents. It's actually been suprising to me to see what kind of people I have met the past five years. My photo book, Los Altos-Mountain View Pony League Umpires, shows how one travels from the classroom to the field, what you need when you're on the field and what kind of atmosphere you will encounter in this league. My main purpose here is to show others what view umpires have not only on the game and their jobs, but themselves as a whole. Copyright © 2007 Schaffy. All rights reserved.